Surprisingly, but the game is almost two years old, however there are no DLCs neither free nor paid. Are there any plans on releasing DLCs to Transport Fever eventually? If "yes", then what would it could be? There are currently no plans to release free or paid DLCs for the game. We wanted to focus our effort on the core game. Therefore, we released numerous patches after the release to iron out issues and improve the overall gameplay, usability and modability. Transport Fever is quite popular game, even among modders. Would you like to conduct some modding contest with prize fund again? We are thinking about it, but there are no immediate plans. However, we of course welcome suggestions from the community about a possible theme. Why there are no cargo airplanes (-ships) in the game? Do we have any chance to see them? The game is balanced in such a way, that cargo will prefer slower and cheaper routes. Planes are meant for passengers which want to travel fast, while ships are used for cargo and passengers which want to travel cheap. Transport Fever is a game about cargoes and passengers. Would you like to add new means of public transportation, for example, trolleybuses or subways? Or maybe something brand new like fluid transportation by pipelines. Also electricity could provide new and interesting gameplay. It sounds intriguing and we are fascinated to see, that modders are going to great lengths to replicate new means of transport like cable cars and subways with existing tools. We will probably not add new modes of transportation, but we are trying to make modding more accessible, for example we recently expanding the content of the Wiki to further support this. Also are you willing to add new goods and production chains? The same answer applies here: Not at the moment, but we hope we can help modders to develop their ideas. Do you have any plans, which you can reveal, for the future? For how long are you going to support Transport Fever? Do you have any ideas about your new games? We plan to continue support as long as it is finically sustainable, and we will try our best to make sure, Transport Fever will continue to function on future operating systems and hardware. We will of course also keep the support email address open for any question regarding the game beyond the last patch. Some players states that a few music compositions have been removed from the game. If that is true, then why it has happened? The game´s soundtrack was not changed since the release and still consist of 32 tracks. But only a portion of the composition is played depending on the in-game year. If a player starts in 1850, over time the selection of music changes and old pieces will no longer be played. This might give the impression, that something was removed. Note that this era-dependent music feature can be disabled in the main menu. One more music related question. I think that Transport Fever has a great soundtrack comparing to many other strategy/business simulation games. Why don't you release soundtrack separately from the game for those who wants to listen to it? Thanks for the praise. The soundtrack is not encrypted, so everybody who bought the game, can access it easily and listen to it on any music player app. Following on from the last question, this would also be a simple way to listen to one’s favourite pieces independent from the in-game year. Would you like to add to Transport Fever or your next game (if it is also going to be a tycoon game) AI competitors? Integrating AI competition as well as multiplayer is challenging. While it is doable to some extend from a technical standpoint, it does take a lot of effort due to the game being non-grid-based. On top of that is difficult to make it fun and challenging at the same time. Competition should not just get in the way, but present new possibilities to play the game and ways to think about strategy and a game must be designed for that. For Transport Fever we decided the time is better spent on making a great single player experience, where the player can choose his own goals in the sandbox and face challenges in the campaign. That said, we still would like to make a game which includes multiplayer or AI at some point in the future. Do you have any plans for releasing global free updates for Transport Fever in the not far distant future? There is still a lot on the wish list. Although we of course cannot implement all player suggestions, we are considering the most popular requests. Why did you abandon the first-person view for passengers in vehicles? Would you like to return it to the game? It felt incomplete and didn´t look great in some cases. 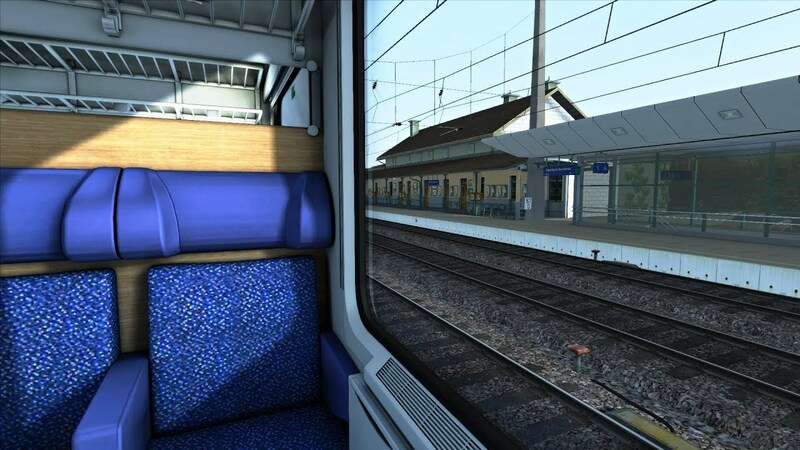 Train station for example have underpasses, which are not modeled, vehicle interiors would need more work, and some vehicles like planes don´t have interiors at all. So, a lot additionalwork would have been necessary to make it a feature with an acceptable quality. Official Transport Fever website tell us, that Urban Games counts only 12 people. Are you going to strengthen your team with new people before creating the next game? Currently the team is complete, but we are upholding the possibility to employ additional staff or outsource certain tasks, should the necessity arise. What kind of games would you like to create in future? Is there any chance that next game will be drastically different from Train and Transport Fevers? We have a lot of creative people in the team with deep knowledge of games in various genres. That said, our current strength is in the genre Train and Transport Fever originates in. And there is still a lot which can be improved and added to the concept. Therefore, a drastic difference in the next game is rather unlikely. Vehicles of what countries could possibly appear in the game? If new countries were added to the game, would they have their own campaigns? Transport Fever has an international player base, so nearly everything would be possible. However, due to the active modding community and very high quality of their work, there are currently no plans to add new vehicles to the game. Why there are no random tasks/quests in the game? Would you like to add them? Although this was never planned for the sandbox game, random tasks and quest could be realized with modded mission script to some extent. Admittedly it is not an easy task to mod a campaign. Therefore, we meanwhile provided some information on the Wiki, including an example. Before the game release, you said that day/night cycle and/or weather effects could appear. Should we expect these features in the not far distant future? While we would love to see the game visually improved, it is not an immediate plan. Currently we have other priorities. A season cycle – while visually appealing - would not add any gameplay, without changing some fundamental rules and the pacing. Thus, the benefit compared to the effort would be unfavourable. And as you said, there are some great mods, which allows the player to change the game to the desired season. Are you going to show something new on any expo? If yes, then what expos will it be? Not in the near future, but if at some point a new project is ready to be shown publicly, expos and conventions like Gamescom, E3 or PAX are a popular occasion. Überraschenderweise wurden bislang weder kostenlose noch kostenpflichtige DLCs angekündigt. Gibt es Pläne, irgendwann DLCs für Transport Fever zu veröffentlichen? Wenn "ja", was könnte es dann sein? Es gibt derzeit keine Pläne, kostenlose oder bezahlte DLCs für das Spiel zu veröffentlichen. Wir wollten unsere Bemühungen auf das Kernspiel konzentrieren. Deshalb haben wir nach der Veröffentlichung zahlreiche Patches veröffentlicht, um Probleme zu beheben und das gesamte Gameplay, die Benutzerfreundlichkeit und die Modifizierbarkeit zu verbessern. Transport Fever ist ein sehr beliebtes Spiel, sogar bei Moddern. Möchtet ihr wieder einen Modding-Wettbewerb mit Preisgeld durchführen? Wir denken darüber nach, aber es gibt keine unmittelbaren Pläne. Natürlich begrüßen wir auch Vorschläge aus der Community zu einem möglichen Thema. Warum gibt es keine Frachtflugzeuge bzw. Luftschiffe im Spiel? Besteht die Chance, dass das noch kommt? Das Spiel ist so ausgewogen, dass die Fracht langsamere und billigere Routen bevorzugt. Flugzeuge sind für Passagiere gedacht, die schnell reisen wollen, während Schiffe für Fracht und Passagiere, die billig reisen wollen, gedacht sind. Transport Fever ist ein Spiel mit Fracht und Passagieren. Möchtet ihr neue öffentliche Verkehrsmittel wie z.B. Trolleybusse oder U-Bahnen hinzufügen? Oder vielleicht etwas ganz Neues wie der Flüssigkeitstransport durch Rohrleitungen. Auch Strom könnte für neues und interessantes Gameplay sorgen. Es klingt faszinierend und wir sind fasziniert zu sehen, dass Modder große Anstrengungen unternehmen, um neue Verkehrsmittel wie Seilbahnen und U-Bahnen mit vorhandenen Werkzeugen nachzubilden. Wir werden wahrscheinlich keine neuen Verkehrsmittel hinzufügen, aber wir versuchen, das Modding zugänglicher zu machen, zum Beispiel haben wir kürzlich den Inhalt des Wikis erweitert, um dies weiter zu unterstützen. Sind Sie auch bereit, neue Waren und Produktionsketten hinzuzufügen? Die gleiche Antwort gilt hier: Im Moment nicht, aber wir hoffen, dass wir Moddern helfen können, ihre Ideen zu verwirklichen. Habt ihr Zukunftspläne, die du schon verraten kannst? Wie lange werdet ihr Transport Fever unterstützen? Habt ihr schon irgendwelche Ideen zu euren neuen Spielen? Wir planen, den Support so lange fortzusetzen, wie er letztlich nachhaltig ist, und wir werden unser Bestes tun, um sicherzustellen, dass Transport Fever auch auf zukünftigen Betriebssystemen und Hardware funktioniert. Natürlich werden wir auch die Support-E-Mail-Adresse für alle Fragen zum Spiel über den letzten Patch hinaus offen halten. Einige Spieler behaupten, dass einige Musikkompositionen aus dem Spiel entfernt wurden. Wenn das wahr ist, warum ist es dann passiert? Der Soundtrack des Spiels wurde seit der Veröffentlichung nicht verändert und besteht immer noch aus 32 Titeln. Ein Teil der Titel wird aber in Abhängigkeit vom Jahr im Spiel gespielt. Wenn ein Spieler 1850 beginnt, ändert sich im Laufe der Zeit die Auswahl der Musik und alte Stücke werden nicht mehr gespielt. Dies könnte den Eindruck erwecken, dass etwas entfernt wurde. Es ist möglich, diese zeitabhängige Musikfunktion im Hauptmenü zu deaktivieren. Noch eine weitere musikbezogene Frage. Ich denke, dass Transport Fever einen großartigen Soundtrack hat, verglichen mit vielen anderen Strategie- und Unternehmenssimulationsspielen. Warum veröffentlicht ihr den Soundtrack nicht getrennt vom Spiel für diejenigen, die ihn hören wollen? Danke für das Lob. Der Soundtrack ist nicht verschlüsselt, so dass jeder, der das Spiel gekauft hat, leicht darauf zugreifen und es in jeder Musikplayer-App hören kann. In Bezug auf die vorherige Frage wäre dies auch eine einfache Möglichkeit, seine Lieblingsstücke unabhängig vom Jahr im Spiel zu hören. Möchtet ihr zu Transport Fever oder dem nächsten Spiel (wenn es auch ein Tycoon-Spiel sein wird) KI-Wettbewerber hinzufügen? Die Integration von KI-Wettbewerb und Multiplayer ist eine Herausforderung. Obwohl es aus technischer Sicht teilweise machbar ist, erfordert es viel Aufwand, da das Spiel nicht gridbasiert ist. Außerdem ist es schwierig, es lustig und herausfordernd zugleich zu machen. Der Wettbewerb sollte nicht nur im Weg stehen, sondern neue Spielmöglichkeiten und Denkweisen für die Strategie eröffnen, und dafür muss ein Spiel konzipiert werden. Für Transport Fever haben wir beschlossen, dass die Zeit besser damit verbracht wird, ein großartiges Einzelspielererlebnis zu schaffen, bei dem der Spieler im Sandkastenmodus seine eigenen Ziele wählen und sich den Herausforderungen der Kampagne stellen kann. Allerdings möchten wir auch in Zukunft ein Spiel machen, das Multiplayer oder KI beinhaltet. Habt ihr Pläne, in nicht allzu ferner Zukunft globale kostenlose Updates für Transport Fever zu veröffentlichen? Es steht noch viel auf dem Wunschzettel. Obwohl wir natürlich nicht alle Spieler-Vorschläge umsetzen können, berücksichtigen wir die beliebtesten Anfragen. Warum haben Sie die First-Person-Ansicht für Fahrgäste in Fahrzeugen aufgegeben? Möchtest du es zurück ins Spiel bringen? Es fühlte sich unvollständig an und sieht in einigen Fällen nicht wirklich gut aus. Der Bahnhof hat zum Beispiel Unterführungen, die nicht modelliert sind, der Fahrzeuginnenraum würde mehr Arbeit erfordern, und einige Fahrzeuge wie Flugzeuge haben überhaupt keinen Innenraum. Es wäre also viel zusätzlicher Aufwand erforderlich gewesen, um es zu einem Feature mit akzeptabler Qualität zu machen. Die offizielle Transport Fever Website sagt uns, dass Urban Games 12 Mitarbeiter hat. Wirst das Team mit neuen Leuten verstärkt werden, bevor das nächste Spiel entwickelt wird? Derzeit ist das Team komplett, aber wir halten die Möglichkeit aufrecht, zusätzliches Personal einzustellen oder bestimmte Aufgaben auszulagern, falls sich die Notwendigkeit ergibt. Welche Art von Spielen möchtet ihr in Zukunft entwickeln? Besteht die Möglichkeit, dass sich das nächste Spiel drastisch von Train Fever und Transport Fever unterscheidet? Wir haben viele kreative Mitarbeiter im Team, die über fundierte Kenntnisse von Spielen in verschiedenen Genres verfügen. Unsere aktuelle Stärke liegt jedoch im Genre in dem Train und Transport Fever beheimatet sind. Und es gibt noch viel zu verbessern und das Konzept zu erweitern. Daher ist ein drastischer Unterschied im nächsten Spiel eher unwahrscheinlich. Gibt es Überlegungen zu Fahrzeugen aus anderen Ländern? Wenn neue Länder dem Spiel hinzugefügt würden, hätten sie dann ihre eigenen Kampagnen? Transport Fever hat eine internationale Spielerbasis, so dass fast alles möglich wäre. Aufgrund der aktiven Modding-Community und der sehr hohen Qualität ihrer Arbeit ist es jedoch derzeit nicht geplant, neue Fahrzeuge in das Spiel aufzunehmen. Warum gibt es keine zufälligen Aufgaben/Anfragen im Spiel? Möchtet ihr sie hinzufügen? Obwohl dies für das Sandkastenspiel nie geplant war, könnten Zufallsaufgaben und Quests mit modifiziertem Missionsskript teilweise realisiert werden. Zugegebenermaßen ist es keine leichte Aufgabe, eine Kampagne zu erstellen. Deshalb haben wir inzwischen einige Informationen über das Wiki bereitgestellt, darunter ein Beispiel. Vor der Veröffentlichung des Spiels haben Sie gesagt, dass Tag/Nacht-Zyklus und/oder Wettereffekte auftreten können. Sollten wir diese Merkmale in nicht allzu ferner Zukunft erwarten? Wir würden uns zwar freuen, wenn das Spiel optisch verbessert werden würde, aber es ist kein sofortiger Plan. Derzeit haben wir andere Prioritäten. Ein Saisonzyklus - obwohl optisch ansprechend - würde kein Gameplay hinzufügen, ohne einige Grundregeln und das Tempo zu ändern. Somit wäre der Nutzen im Vergleich zum Aufwand ungünstig. Und wie du gesagt hast, es gibt einige tolle Mods, die es dem Spieler ermöglichen, das Spiel auf die gewünschte Saison umzustellen. Werdet ihr wieder auf Messen zu finden sein und neues präsentieren? Wenn ja, wo? Nicht in naher Zukunft, aber wenn irgendwann ein neues Projekt bereit ist, öffentlich gezeigt zu werden, sind Messen und Kongresse wie Gamescom, E3 oder PAX ein beliebter Anlass. Vielen Dank an die Beteiligten für die Erlaubnis zur Veröffentlichung. Immerhin mal ein Lebenszeichen. Bin dann schon gespannt was im nächsten Jahr angekündigt wird. Das man sich weiter auf Transport fokusieren will, lässt hoffen. Bin nicht böse was DLCs betrifft. Da hat man sich durch die hohe Modbarkeit selber auch bissel das Wasser abgegraben. Wirklich klasse was da alles von der Community kommt! Mir fällt in dem Zusammenhang nur Cities: Skylines ein, was ähnlich offen für die Community ist. Aber da sieht man auch, wie sich DLCs und Mods vertragen. Für mich war das Lebenszeichen von UG bzw das es weiter geht die wichtigste News! Wie und was sollte man auch erst sagen wenn es fest ist, nicht das man am ende enttäuscht wird weil man so große erwartungen geweckt hat. Also für jeden der etwas Verstand hat war dieses Interview richtig und nachvollziehbar. Aber man kann es NIE allen recht machen. Ist sehr interessant. Nur ein Anliegen: Man müsste die Frage und Antworten besser voneinander unterscheidend machen. Hatte zuerst Problem, dass auseinander zu halten. "Unsere aktuelle Stärke liegt jedoch im Genre in dem Train und Transport Fever beheimatet sind. Und es gibt noch viel zu verbessern und das Konzept zu erweitern. Daher ist ein drastischer Unterschied im nächsten Spiel eher unwahrscheinlich." Das war der einzig interessante Satz im Interview. Ich frage mich allerdings, von was leben die Jungs eigentlich die ganze Zeit. Ausser kostenlosen Patches wurde ja nichts produziert. Und 12 Mitarbeiter wollen ja auch bezahlt werden. Naja, wenn du das ganze mal grob durchrechnest hat sich Transportfever schon gelohnt, insofern... Warte einfach mal den Patch Ende des Jahres ab und später werden sie schon ankündigen wie es weitergeht. Entwickler machen ja auch Auftragsarbeiten, um Geld in ihre Kasse zu bringen. Und wenn ein neues großes Update kam, und TpF im Angebot war, wurden wieder Versionen verkauft. Wenn dem nicht so wäre, wäre TpF nicht so langlebig gewesen. Es gibt ne planbare Zahl von Spielern aus der Branche, die zu TF/TpF gewechselt sind und zB OTTD den Rücken gekehrt haben (ich gehöre auch dazu). Der Aufbauspielmarkt ist umkämpft und ich ziehe den Hut vor UG, kein DLC-Dschungel zu erzeugen, wie es zB CO bei CSL tut. Ich könnte euch als Urban Games nur empfehlen, ein bezahltes DLC rauszubringen, z.B. eins was Trolleybusse und U-Bahnen hinzufügt, oder ein Vehicle pack was spezifische zusätzliche Gebiete (Asien, Afrika, Südamerika?) abdeckt. Das könnte euch noch einmal eine Einnahmequelle bescheren. Ich finde es echt Krass, das ihr nur 12 Mitarbeiter habt und so klasse Spiele rausbringen tut, echt ich bekomme schon Gänsehaut wenn ich so manche stellen lesen tue oder die Schönbauer so extrem viel Zeit investieren in einer Map das die täuschend echt aussehen tut. Großes Lob an UG und an die Schönbauer. Die "Schönbauer" können auch nur das anwenden oder versuchen umzusetzen, was zuvor von der Modder Community so angeboten wird. Insofern gebührt ihnen wohl das größer Lob. Aber eigentlich das meißte an Urban Games weil die haben es ja überhaupt gesteigert das man die Innenausstattung so Modellieren kann. Noch eine Anmerkung meinerseits: Ich habe ich Vorfeld schon betont, dass es sehr ungünstiger Zeitpunkt für ein solches Interview ist. War bzw. ist ja noch vor der Ankündigung des neuen Spiels – und auch was in den Patch kommt, ist noch nicht ganz klar - zum Zeitpunkt des Interviews war der noch nicht mal angekündigt. Das verstehe ich total. Das war eigentlich eher als Scherz oder sogar als Anerkennung gemeint. Das hält die Vorfreude schön hoch. Ja, war eigentlich keine grosse Aussage in dem Interview. Was sind denn eigentlich die weitergehenden Pläne nach dem Thank you patch? Ich finde es echt erstaunlich, wie gut Entwickler einen Ausweg finden, wenn sie etwas gefragt werden zu dem sie noch nicht sagen dürfen. Ich freue mich schon jetzt auf den Patch und weitere Spiele. We'll that didn't say a lot. Conspicuous by it's absence. This would be nice, but like Tom said, it would be a lot work, to make that. But maybe they just could release the not-so-perfect version, they had in the beta, as a mod - so when we want to have that unfinished product, we can use it. I would definately install it! So bleibt nur ein diplomatisches "schaun wir mal, dann werden wir schon sehen" übrig... Gleichzeitig sind die Fragen aber auch teilweise etwas redundant. siehe Kommentar von @'Zargom'. Das hat schon seine Beweggründe. Die Antworten sind wie von einem Politiker gesprochen. Viel gesagt und dennoch nichts ausgesagt. Ich verstehe es auch warum. Wenn er zb etwas erwähnt hätte das sie irgendwas machen (nur ein Beispiel) dann würden sich Leute daran „aufgeilen“ wenn es doch nicht umgesetzt wird. Siehe Wendezug Thema. Hab irgendwie den Eindruck Urban Games arbeitete mit dem bestehenden Team eigentlich schon an was Anderem (Nachfolger oder neues Game), und nur durch die anhaltenden Verkaufszahlen fühlte man sich nochmals gefordert nen weiteren Patch in Gang zu bringen. Team verkleinert haben se scheinbar nicht dem Interview nach, aber so richtig an TPF entwickelt (DLC oder Ähnliches) wurde wohl auch nicht den Verweisen auf Modder nach. TPF hat so ein paar offene Baustellen (vor allem KI-Bau und Balancing) die nur unzureichend von Moddern zu lösen sind, kann man nur hoffen das unser anhaltendes Interesse genug Motivation aufbaute, das im nun endlich angekündigten Patch ordentlich abzuschliessen bevor man gänzlich TPF abhakt. Also wirklich konretes hat er ja jetzt nicht erzählt. Muss ja nicht nur negativ sein. Es gibt genug Hersteller, die ein Thema mit immer neuen Spielen ohne wirklichen Fortschritt auf den Markt hauen, um sich jede kleinste optische Neuerung bezahlen zu lassen. Dass man das Spiel nach zwei Jahren immer noch durch Patches unterstützen will finde ich eher positiv. Und Transport Fever belegt schon noch so eine Art Marktnische. Vielleicht nicht in Originalfassung, aber auf alle Fälle in Verbindung mit den Mods. Und gerade hier will UG ja offenbar weiter unterstützen. Dass Tom hier in dem Interview keine Spekulationen anheizen kann, steht ja zudem auch auf einem anderen Blatt. Und diese hat er ja auch nicht angeheizt. Fazit: UG unterstützt das Spiel vorerst weiter und hat zudem ein paar Konzepte, die aber noch nicht reif sind. Ist mir auch aufgefallen, liegt aber an den Fragen. Einige sind offensichtlich oder überschneiden sich. Interessant finde ich das mit der First Person Camera, die Musik interessiert mich z.B. garnicht - kann ja jeder einfach abspielen. Bei den Fahrzeugen gibt‘s nichts neues, weil Modder selbst für genug Neues sorgen. Immerhin ist es auch ein Haufen Arbeit, weitere Spielinterne Variablen über Lua-Script zugänglich zu machen um die Modding-Möglichkeiten zu erweitern. Und endlich das mit den Wendezügen hinzugekommen war sicher auch nicht gerade ein Pappenstiel. Und Fahrzeuge basteln können die Modder sicher besser - zumal für die Modder nicht gilt "Zeit ist Geld". So viel Mühe mit den Fahrzeugen darf sich UG gar nicht machen - weil dann die Lohnkosten irgendwann die Einnahmen überschreiten. Ist doch sinnvoll, daß sich UG auf das beschränkt was es am besten kann oder was nur UG kann, nämlich den Quellcode verändern und alles andere den Moddern überlässt. Das würde ich nicht so sehen. Als TF-Nachfolger (TF habe ich nicht) macht sich das Spiel wirklich nicht schlecht. Mit heutigen Maßstäben zu messen, finde ich nicht fair. TF/TPF bedienen eine Marktlücke, die eben nicht eine solch breite Masse anspricht wie viele andere Spiele. Aber sie haben eine funktionierende Community, die sehr viel zum Spielspass beitragen, in dem sie so viele Mods entwickeln. Sehe ich auch so. Ich möchte mir nicht ausmalen, was passiert, wenn sie tief ins die Spielmechanik eingreifen und diverse Mods dann nicht mehr (richtig) funktionieren. Insofern kann ich verstehen, wenn sie sich mit neuen Features zurückhalten. Fragt mal die Modder bei Minecraft, wenn sie in regelmässigem Turnus ihre Mods anpassen müssen, weil M$ mal wieder an der API ändert. Mittlerweile ist das Spiel bei 1.14, die meisten Mods aber noch bei 1.12 oder kleiner. Oder EEP Eisenbahn.exe, bei der (fast) jede Mod bezahlt werden muss. Da bin ich bei TPF doch sehr gut aufgehoben, können wir doch erstmal weiter an unseren Maps bauen und uns regelmäßiger Mods erfreuen. Der Community sei Dank.